Usually, the worst parts of a cruise are the embarkation and the disembarkation. A poor experience embarking can affect a passenger's perception of the cruise line and the ship throughout the rest of the cruise. A bad disembarkation means that your last memory of the cruise is a bad one. To address such issues, several cruise lines are building new smart cruise terminals, using the latest in high technology to speed up the process and make embarkation and disembarkation more pleasant. One of these new terminals is Royal Caribbean's Terminal A in Miami, which opened in November 2018. The new terminal is a partnership between Royal Caribbean and Miami Dade County. It cost $250 million. Royal funded the construction and Miami Dade provided $15 million infrastructure improvements. The cruise line pays $9.5 million a year to rent the land. Designed by the architectural firm BroadwayMalyan, Terminal A does not look like a traditional cruise ship terminal. It is an interesting modern building with slanted, pointed sections rising toward the sky, hence the nick-name “Crown of Miami” A glass wall facing the water allows in natural light. Two giant, golden propellors are suspended above you as you rise up the escalator from the ground floor where you enter to the floor where the embarkation processing takes place. It bears no relation to a utilitarian bus terminal. We experienced Terminal A in connection with two cruises shortly after it opened. 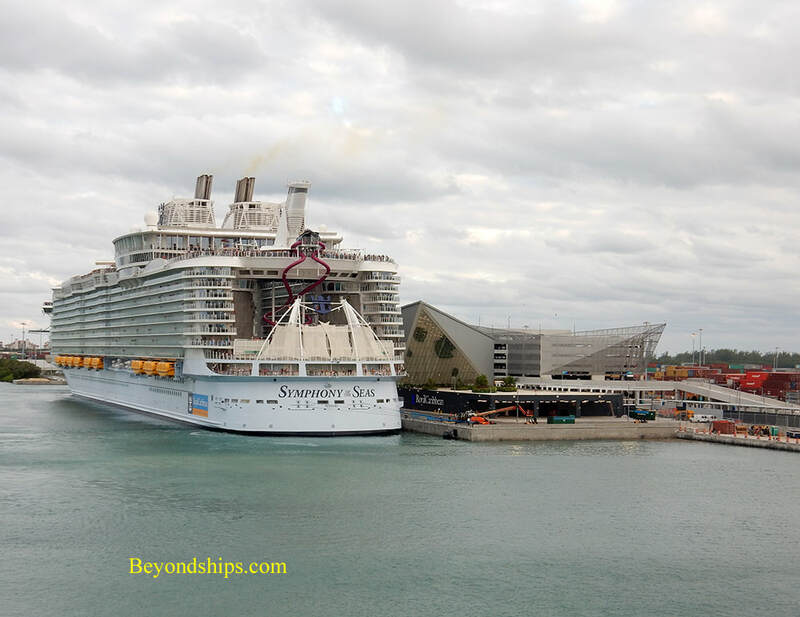 The first was for a cruise on Mariner of the Seas and the second was for a cruise on Royal's newest ship the Oasis-class giant Symphony of the Seas. The new terminal is towards the eastern end of the cruise port. Thus, you need to pass all of the other cruise terminals in order to reach it. In addition, beyond the cruise port on Dodge island are container facilities. Consequently, during the peak hours, there can be a lot of traffic trying to move through a bottleneck. At the moment, there is construction next to Terminal A as Norwegian Cruise Line is building its own smart terminal. This, of course, affects the traffic flow to Terminal A. In addition, Terminal A is not connected by sidewalk to the other Miami terminals. Thus, you cannot walk to Terminal A.
Terminal A has its own multi-story parking facility. However, most guests are dropped off in front of the terminal building. 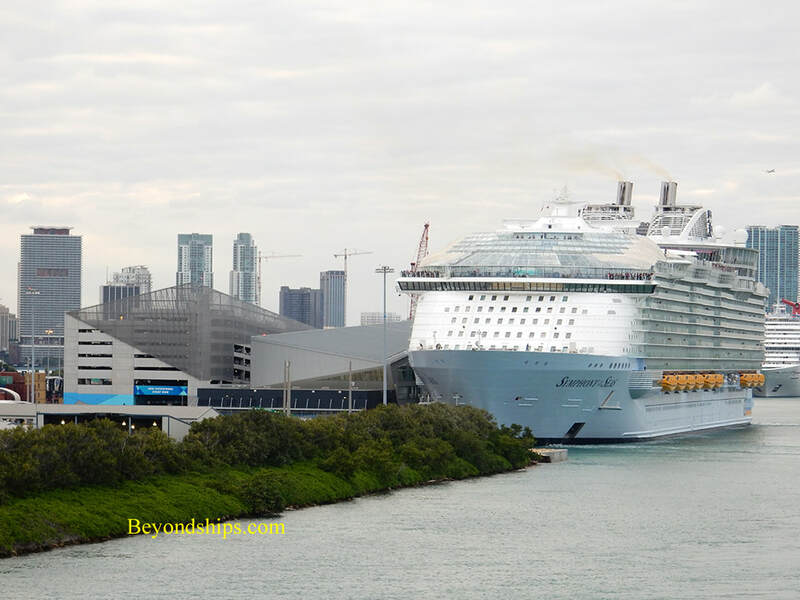 For the Mariner cruise, we arrived late in the morning at the time specified by Royal Caribbean on the boarding pass that you print out prior to the cruise. The drop off area was very congested but eventually, the driver found a bit of curb and we were able to offload the luggage. More and more of the cruise lines seem to be allocating appointment times for embarkation. The theory is that by spreading the arrival times over the course of the day, it will prevent congestion and make for orderly embarkation. The first problem with this theory is that it runs counter to human nature. Most people want to maximize their vacation time and so they want to begin their cruise as soon as the doors open. In addition, guests who are traveling some distance to the cruise port do not have much control over the time they arrive. To illustrate, if a flight arrives at 10 a.m., few people are going to hang around the airport until say 2 p.m. in order to arrive at the cruise port at their appointment time. Our cruise on Symphony followed a cruise on another ship that ended that same day. As a result, we arrived at Terminal A early and sat outside for a time observing. What appeared to be happening was that guests disembarking from the previous cruise were pouring out of Terminal A faster than vehicles could pick them up. As a result, a wall of guests and bags formed along the curbside, which made it difficult for those guests further back to get to the curb when the car they were waiting for appeared. In addition, guests began arriving for the next cruise as early as 9 a.m., adding to the congestion and chaos. The same situation was observed at the end of our cruise. Guests arriving at Terminal A enter into a large spacious lobby with a 30-foot high ceiling and take the escalators up to the next level. It is a spacious and pleasant entrance. At the top of the escalator, guests are directed to a set of people with hand-held devices. These people check you in by scanning your boarding pass. There are no forms to fill out and the agent does not go off in search of your key card (you get your card once you are aboard the ship in a slot outside your stateroom). So the check in process is normally very quick. 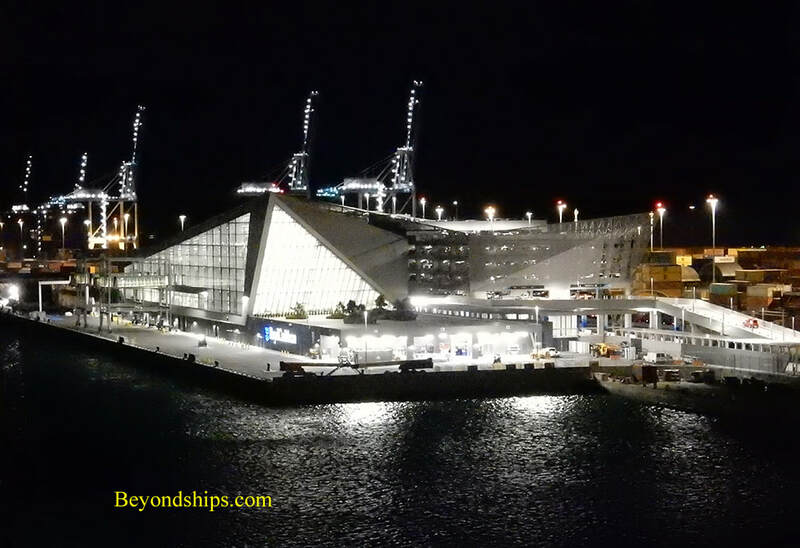 Above and below: Symphony of the Seas at Terminal A. The technology worked for the Mariner cruise but did not work for us on Symphony. Even though both boarding passes had been printed on the same computer printer at the same time, the hand-held device could read the Mariner boarding pass but could not read the Symphony boarding pass. Consequently, the agent took us over to a desk where a new boarding pass was printed out. This did not take long and was painless. It also appeared to us that the technology was working for the vast majority of the guests who were embarking. Once checked in, you go through security. This was much the same as elsewhere. Next, it is up another set of escalators to a waiting area. This is a large room with rows of seats. Guests staying in suites and guests who are Pinacle level in the Crown & Anchor loyalty program have a separate waiting area. On the Mariner cruise, the ship was already boarding passengers and so we did not have to sit down. However, there was a line on the gangway flowing back from where the ship's security team was scanning each boarding pass again. For the Symphony cruise, the ship was not ready for boarding when we arrived. We were directed to take a seat - - any seat - - in the waiting area where there was already a large group of people. A man on the public address system repeatedly asked people to be seated and said that boarding would begin shortly. Once it began, it would proceed according to the guests' level in the Crown & Anchor loyalty program Diamond Plus level would be first, then Diamond etc. First-time cruisers would then board according to their appointment times. Most of the people sat down but more than a few just stood by the exit to the gangway. Also, guests sat where they could find a seat without regard for the planned order of boarding. Thus, someone who was Diamond level for example would have to climb past a family of first time cruisers once the Diamond level were called to board. When boarding was announced, there was a rush toward the gangway reminiscent of the Oklahoma Land Grabs in the 19th century. Two levels of the loyalty program were called at the same time. People in the seats were pushing around each other. People who had been standing around near the entrance were swept towards the gangway. This chaos was surprising. Royal Caribbean has been embarking guests onto Oasis class ships for nearly a decade. Our experience boarding the Oasis class ships in the terminal in Fort Lauderdale has been quite orderly. Once a guest was checked in, he or she was directed to a specific section of the waiting area where they had to sit down. When boarding began, the various sections were called in order. Indeed, they were called by row within each section. It was much more regimented but far less chaotic and less dangerous. Turning to disembarkation, the big change here is that after retrieving your luggage in the terminal, those guests who are carrying a U.S. passport do not go through the traditional re-entry interview but rather just look into a device that processes the re-entry using some sort of facial recognition software. It only takes a few seconds and you are out the door. In sum, Terminal A is an impressive building and the technology works to improve the embarkation and disembarkation experiences. However, there is room for improvement in the management of the people flow, particularly in the drop-off and pick-up of passengers outside the building.